Fiction – paperback; Quercus Publishing; 400 pages; 2010. When I reviewed Peter Temple’s The Broken Shore in 2007 I described it as a “refreshing take on crime fiction, both in setting and style”. So when his follow-up to that novel, Truth, won the Miles Franklin Award in 2009 I wasn’t too caught up in the hype about it being the first crime novel to win such a prestigious literary prize. I suspected that it probably had strong literary leanings. I was right. Two killings — are they linked? 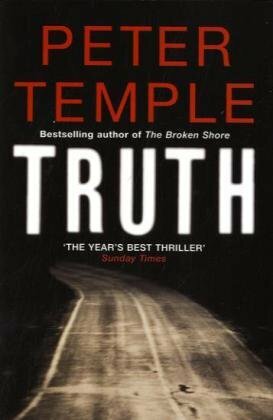 Truth is set in Melbourne, Victoria, and focuses on two separate killings — the murder of a young woman in a luxury apartment block and the discovery of three mutilated drug dealers in a warehouse on the other side of the city — which may, or may not, be linked. But this is not so much a crime novel but an exposé on corruption — of cops, of businessmen, of politicians. And while it certainly shares characteristics with the detective genre, the book’s central focus is less on the gruesome killings that Inspector Stephen Villani, the head of homicide investigates, but more on the ways in which Villani copes with events happening in his personal and professional life. Temple’s prose style is also hard to characterise. There are some chapters which move ahead chiefly through dialogue, and these are blunt and snappy, with everyone talking in a staccato rhythm. But elsewhere, when he describes the city or the bushfires raging in the state’s north-west, he’s rather lyrical and poetic. A hot north-west wind on their faces, another blocking system was idling out in the southern ocean. Two long valleys ran from the north-west towards Selbourne, the main road down one of them. The fire would come as it came to Marysville and Kinglake on that February hell day, come with the terrible thunder of a million hooves, come rolling, flowing, as high as a twenty-storey building, throwing red-hot spears and fireballs hundreds of metres ahead, sucking air from trees, houses, people, animals, sucking air out of everything in the landscape, creating its own howling wind, getting hotter and hotter, a huge blacksmith’s reducing fire that melted humans and animals, detonated buildings, turned soft metals to flowing silver liquids and buckled steel. Then there’s the complicated relationship he has with his bullish father, a man who is now refusing to leave his property despite the imminent threat of bushfire. The state of Villani’s personal life is only matched by his working life, which is also strained to breaking point. He doesn’t feel he’s earned the right to be head of homicide — and there are plenty of others in the force who feel the same way — so he’s constantly on guard, doing things under the radar or taking risks to get results. All this means that the book feels claustrophobic — and depressing. I felt heavy-hearted whenever I picked it up and I was anxious to be rid of it. Villani remembered when the CBD was still safe enough to walk across on a Friday night. But once the chemicals took over, spread into the suburbs, cops regularly began to see things once rare — teenagers bashing old people, women and children beaten, the punching and kicking and stabbing of neighbours, friends, cab drivers, people on trains, trams, buses, strangers at parties, in pubs and nightclubs, the hacking at people with swords, road-rage attacks, bricks hurled at trams, train drivers. I think it’s fair to say that I appreciated Truth — particularly the banter between the cops and the examination of their human failings — but I didn’t like it. The novel was too dark, too edgy, too noirish for me. I found the crime investigation difficult to follow and the subsequent resolution slightly far-fetched. But I wouldn’t mind seeing the film when it finally gets released. excellent review Kim. I never did manage to review the book because I felt so conflicted – on the one hand I can’t help but admire the way Temple writes but on the other hand I never wanted to pick it up and finish it – it just made me feel so glum. I had a similar experience with Chris Womersley’s Bereft. I just came across Peter Temple in another blog and bought The Broken Shore for my e-reader but haven’t got around to reading it yet. Am curious now since reading this review of another of his books. Excellent review and I understand the ambivalence that you and Bernadette report. For me, the grimness this book depcits (and it is relentless) is exactly right, it is like that. But I realise not everyone feels that way. (The character of Erlunder in Arnaldur Indridason is close, though those books (perhaps because they are translated) are not as literary as Temple. Where Temple falls down in my opinion is the plot outcome (the fire/father at the end of this one) but most crime authors can’t do endings, it is a general failing of the genre. Another failing of Temple is that all his protagonists are extensions of himself- successful with women, good at carpentry, etc. Truth (Villani) is a bit of a departure in that respect, apart from possibly the women bit! I should clarify – extensions of his image of himself! I have no idea if he’s really like that, but all his male protags are the same person so I assume there is an element of wish=fulfillment in it. What a relief it is to read this review, glum and unwilling to read any more of it is exactly how I felt about it too. So much so, that although I am collecting all the Miles Franklin winners, I can’t yet bring myself to shell out for a First Edition of a book I attempted twice and didn’t finish. Brilliant review. I got really excited when Truth won the Miles Franklin, and rushed out and pruchased it. I had heard though that The Broken Shore was a precurser to Truth and so I decided to read it first. I did, but somehow by then my enthusiasm for Truth had warn off and I still haven’t got too it. I appreicate Peter Temple because I think that crime fiction in all its varieties is under rated. Last year I realised how little I read and made a decided point of exploring the genre and have been really surprised. I admit that I have steered clear of the modern day popular crime fiction and gone down the more literary path but I have found some gems. Peter Temple I appreciate because the quality of his prose is amazing and I really get a very emotive sense of Australia in what I read. I do agree though that it very dark and depressing stuff. I think that this says a lot for the quality of his writing but it can be difficult to enjoy such darkness. My biggest complaint was that I read An Iron ROse first, and then The Broken Shore and I found them to be incredibly similar in pace, language, content etc. I think I expected a little more in that sense. But this has been a good reminder that I stil have Truth sittin gon my shelf waiting to read and this year might the years. I have reviews of those other Temple books on my blog if you were interested. I’m glad I’m not the only one who struggled with it… It’s curious though, because I do read a lot of dark and disturbing reads, so I’m not entirely sure why this one made me feel the way I did. Interesting you felt the same about Bereft — I haven’t read that one yet, but it’s on my pile of books to read soon. I really enjoyed The Broken Shore, so please don’t let this review put you off, Jackie. They are very different books, in tone and style. Thanks, Maxine. I think you’re right about the plot outcome of this one… I don’t think the plot is a strength, to be honest, it’s merely a nice hook for Temple to hang his story about Villani on. I have to say I did titter to myself at the scene in which Villani meets Jack Irish in a cafe. I’ve only read one Jack Irish book, but didn’t feel excited enough by it to want to read more in the series. I have to admit that I came close to abandoning this a few times, Lisa, but decided to persevere in the hope it might just get better. But as I said above, I did appreciate the writing and the characterisation, but the mood of the book was a bit too much to bear. It didn’t help that the plot was too confusing to follow and the resolution at the end was just a tad preposterous. I read a lot of crime — probably 25 per cent of my reading — but I tend not to do the dark noirish stuff and Truth was a bit too dark and noirish for my tastes, I think. Even the banter and the jokes between the cops — which I quite liked — had a bitter, hard edge to it. It’s been a long time since I read story with so few moments of light relief, the whole book was just bogged down in grim negativity that I felt nothing but relief when I finished it. As well as Broken Shore, I have previously read one of the Jack Irish novels, which I liked but I’ve not read the rest in the series. I’ll be sure to drop by your blog and check out your Temple reviews. Thanks for letting me know about them.